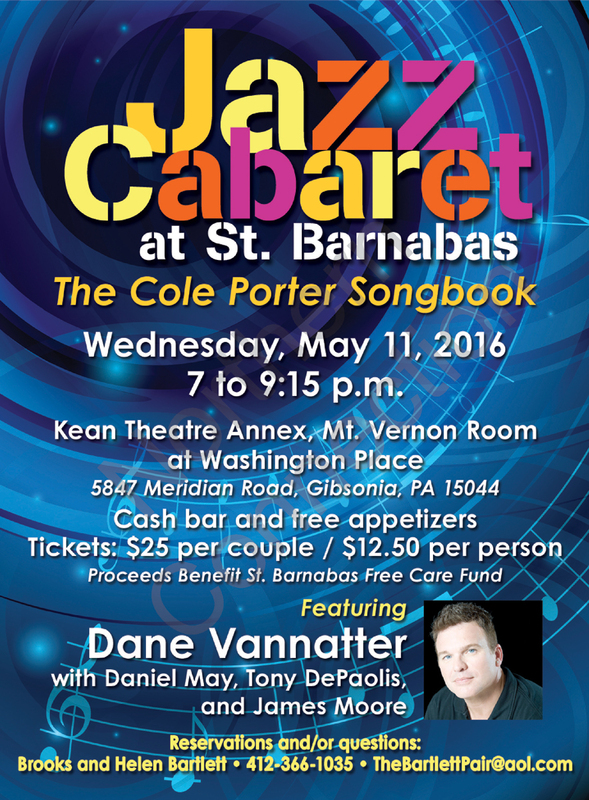 We have completed our plans for our next Jazz Cabaret – Wednesday, May 11, 2016 at the Mt. Vernon Room – Washington Place of the St. Barnabas Health System. This will be another theme evening of music. We are featuring the delightful songs of Cole Porter. Cole Porter wrote over 1,000 songs and many have become jazz standards and commercial successes. Dane Vannatter will present the songs in his great interpretive style that will bring out the Porter lyrical and sophisticated melodies as Cole Porter would have wanted. Dane will be accompanied by Daniel May on piano, Tony DePaolis on bass, and James Moore on trumpet. This celebrated group of musicians will elevate the evening of music to great heights of entertainment. Dane has a new CD –“Give Me Something Real” – that has received rave reviews in “Talking Broadway” by Rob Lester and In “Cabaret Scenes” by John Hoglund. The CD is being played on jazz stations throughout the country. This May presentation will wrap up our second year of Jazz Cabarets. It is our hope to continue these productions. That, of course, depends on your continued support as well as that of our sponsors. We hope you will help us keep jazz “alive and well” in the community just as it was in my younger years – sans the smoke! In addition to your attendance and purchase of tickets, if you would like to become a sponsor, that would be a great help in keeping our endeavor viable. Cash bar, free appetizers and parking. All of those monies go to the “free care fund” for needy patients in the St. Barnabas nursing homes. Your philanthropy and your support of jazz are very much appreciated. Looking forward to seeing you on Wednesday, May 11.